NYC, 02/14/2019, 1:00PM. 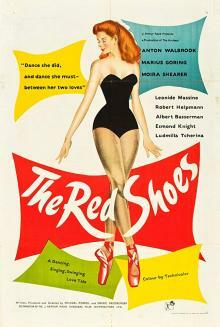 The Red Shoes (1948): Two Oscar winning British Drama. 134 min. Directors: Michael Powell, Emeric Pressburger. At the 21st Academy Awards, The Red Shoes won awards for Best Original Score and Best Art Direction. It also had nominations for Best Picture, Best Original Screenplay and Best Film Editing. Today, it is regarded as one of the best films of Powell and Pressburger's partnership, and in 1999, it was voted the 9th greatest British film of all time by the British Film Institute. In 2017, a poll of 150 actors, directors, writers, producers and critics for Time Out magazine saw it ranked the 5th best British film ever. Filmmakers such as Brian De Palma and Martin Scorsese have named it one of their all-time favourite films.